Want Space for the Kids? Sometimes it’s tricky to fit a traditional tree into your space. Here are five festive alternatives to suit your needs and reflect your personality. Get inspired! 1. Decorate the side table with a tiny pine. Lack the space for a big tree? Go for a mini version instead! A table top plant is just what you need to turn a small table into an instant gift area. 2. Put a personalized “pine” on the wall. Get creative and imagine your dream tree. Then create it on your wall for an eye-catching centerpiece. Push a coffee table against the wall and start building upwards with your choice of deco. Top with a star! 3. Twist a textile tree. Make a wire circular base, and attach five strands of wire to form a cone shape. Decorate your “tree” with ornaments and strips of scraps. Twist fabric round two of the wire strands (just use what you have at home). Then hang it from the ceiling. 4. Save space with a super tiny tree. Last holiday season’s big tree trend was trees cut in half. Take it to the next level and decorate your walls with a tree installation. 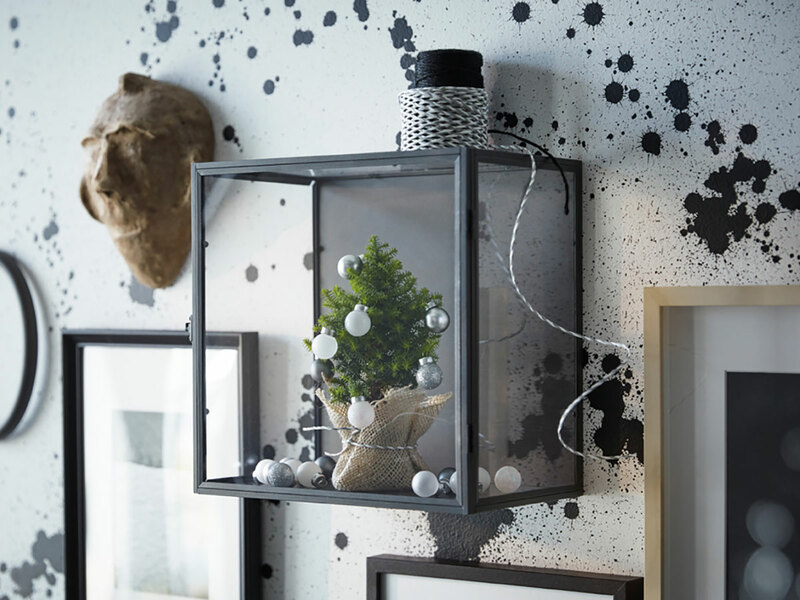 Just put a tree into a display box and let matching frames create a graphic feel. 5. Dress a plant in holiday deco. If you’re a ho-ho-ho traditionalist this tree may feel a little outside the box. But it’s oh so simple. Just decorate a plant you already have at home. We went for tropical holiday deco with silver pearl garlands, hot pink birds and shimmering baubles.